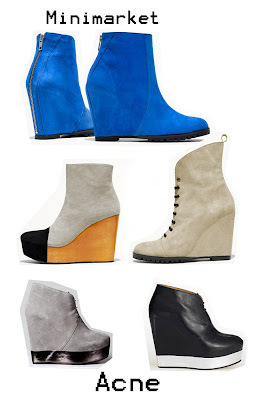 FRAMBOISE FASHION by Sarah Mikaela: Wedges mania! Whyyy whyy whyyy am I broke!!? I am anything but a millionaire, but oh would I love if my budget just had a little bit of space for theese awesome wedges!! My favorites come from the two brands Acne and Minimarket. I've especially fallen for those from Acne, I can't stop thinking about them.. Oh well, if I find the money miraculously in my morning serials, you know where I'm gonna spend it! gahh! i feel you, mikaela. i'm lusting over a pair of hot wedges myself. those shoes are a beauutttts. Lovely blog! And as like another girl said before I found it thanks to lookbook. I've been wanting them since the first saw them!